Forty percent of Republicans view House Speaker John Boehner (R-OH) unfavorably. According to Gallup, 28% of Americans view Boehner favorably, and 50% view him unfavorably. But Boehner does not get much of a boost from his own party. 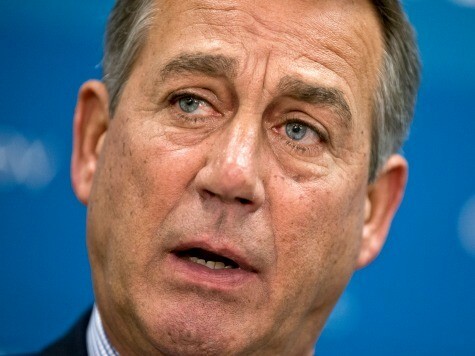 The poll found that 40% of Republicans have an unfavorable view of Boehner, while 46% view him favorably. In contrast, Senate Majority Leader Harry Reid (D-NV) has a net favorability rating among his base, as only 16% view Reid unfavorably, even though his national net favorability rating (-24) is the lowest of his career. Republicans have become more conservative during the last 14 years, according to Gallup’s polling, but Boehner, who got his speakership after the Tea Party fueled Republicans to historic gains in the 2010 midterm elections, has insisted on compromising with President Barack Obama on amnesty legislation, which is the most important issue among Republicans, according to the most recent Gallup poll. Gallup noted that Boehner’s “troubles within the GOP this year could stem from the mounting criticism he has faced from conservatives” over “his support for pursuing comprehensive immigration reform.” Last week, Boehner said he would absolutely try to pass comprehensive amnesty legislation if Republicans control Congress after the midterms, though the GOP could make gains because of the public’s opposition to Obama’s executive amnesty programs. A group of conservatives tried unsuccessfully to oust Boehner after the 2012 elections. Gallup conducted its poll Sept. 25-30.